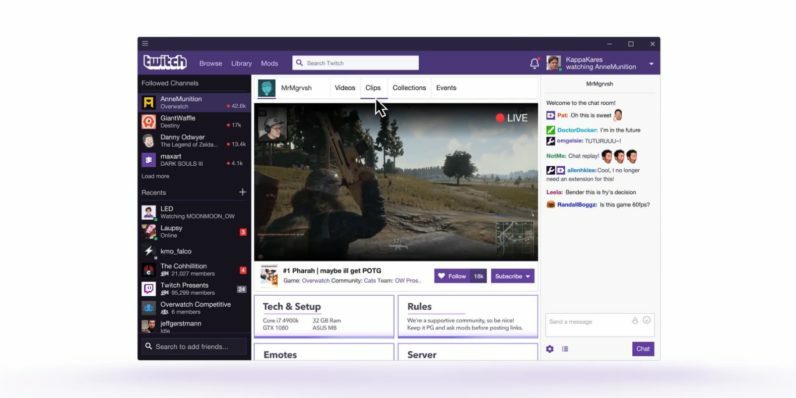 Twitch today released the full version of its desktop app, taking it out of the public beta it’s been in since March. A retooled version of the Curse app, it has several features the in-browser version of the site doesn’t support. For starters, it has video calling and game mod support. It also has the mobile app’s Dark Mode, a black-and-purple beauty I’ll take over the vanilla site any day. Another new feature of which I approve is channel servers — text and voice chat rooms where followers and the streamer can communicate even when the stream itself is offline. Up to this point, content creators have had to rely on third-party software (Discord, usually) to provide their communities with the same options. Finally, I notice the app also has a game library, presumably to better support Twitch’s game marketplace. It has a few bugs — namely, that my profile image and info didn’t carry over, even though the list of streams I follow did. Overall, though, it’s a pretty and useful app. That said, it does have three disadvantages compared with using the site in a browser. First, I can’t turn off ads. I’m a serial stream hopper — I frequently jump between six or seven channels in the space of a few minutes to find someone who suits my mood. The Twitch app has no adblocker, and no way to turn off ads that I could find. So I have to resign myself to watching multiple ads per sitting while trying to find a stream to watch. Second, it doesn’t allow you to view multiple streams simultaneously. Maybe I’m odd, but I’ve gotten pretty good at managing my energies enough to keep up with two channels at once, even if the streamers are playing completely different games. I can’t do that in the app. Third, it doesn’t include support for mods like BetterTwitchTV and FrankerFaceZ, both of which I’ve used for years. It’s not a dealbreaker, but it does take some getting used to. If you can get past (or don’t care about) any of the above, you can download the app here.